(Oregon Coast) – They are the most colorful and most enticing parts of the Oregon coastline. Yet they’re small: often hard to find, although teeming with all sorts of freaky life. They come in weird shapes and configurations, with a stunningly strange biology that is completely alien, compared to us. They do things like lose body parts and regenerate them with regularity, or eat the defenses of their enemies and then use them for their own defense. But first, Morris Grover, an expert in Oregon coast marine life, provides some tide pool hunting tips. 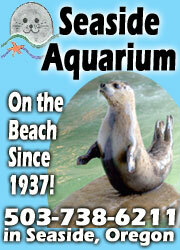 Tiffany Boothe, with the Seaside Aquarium, added more helpful suggestions. Then there are some things to look out for. 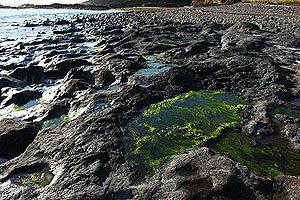 “Tide pooling can be very dangerous, especial in areas that you are not familiar with,” Boothe said. Grover warned against taking anything away. “As a State Park, we would like to remind people that marine life in the pools can be beautiful and fascinating but it is very fragile and will die quickly if moved or removed,” Grover said. “It smells so bad that it is quickly thrown away but it also leaves nothing for the next visitor to see. What can you find in these pools of wonder? One day’s exploration left Boothe with a large list of species and creatures. This list covers Seaside to just north of Florence – as no tide pools are found north of Seaside or in the Florence area. This is a warning you should heed when it comes to all the spots listed here, especially those just south of Yachats. “You can expect to find sea stars, hermit crabs, anemones, small sculpins, mussels and barnacles,” Boothe added. 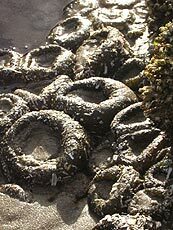 More about Seaside, Oregon, Maps, Beaches with Tide Pools. More about Cannon Beach and the Arch Cape area, maps, beaches with tide pools. There are some tide pools found at times at the extreme southern end of Cannon Beach, near Port Orford Street, next to a small sea stack there. 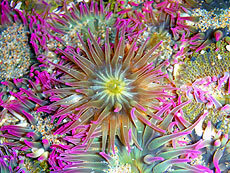 You can expect to find sea stars, hermit crabs, anemones, small sculpins, mussels and limpets. This beach has some incredible features, including sea caves, a waterfall, and that wild, ancient road that was blasted out of the rock to enable Model T’s and horses to get over the point back in the early part of the century. The best tide pooling is at extreme low tides, when the base of that road is visible, with lots of sea life clinging to it. 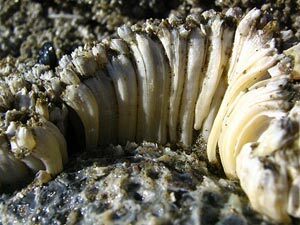 You can expect to find sea stars, hermit crabs, anemones, small sculpins, mussels, limpets, nudibranchs, giant acorn barnacles, plume worms, and porcelain crabs, all right at the north end, close to the access. From here, there are no tide pool areas until south of Rockaway, at Barview, some 15 miles away. You may find some sea stars at the extreme northern end of Manzanita, however. 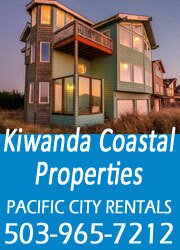 More about Manzanita, Rockaway Beach and Short Sands, as well as maps, beaches with tide pools. This beach access has some rocky areas and a few scattered tide pools. 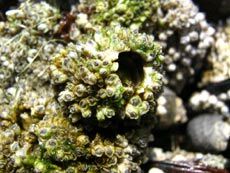 “You'll find barnacles, purple shore crabs, gunnels, snails, limpets and small fish,” Boothe said. The massive, stately rocks at Garibaldi signal some great tide pooling on this shoreline just on the inside of Tillamook Bay. You’ll have to cross the train tracks and the massive rip rap, and these only show up at fairly low tides. There are no more tide pools to be found until you get to Oceanside, some 10 miles south of here, on the other side of the bay. 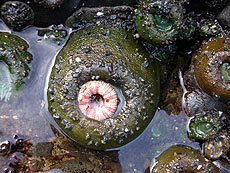 Some may be found at Bayocean, at the beginning of the spit going through Tillamook Bay, but only at really low tides. 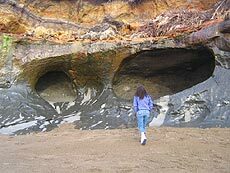 Wander through the tunnel – conditions permitting – to the secret beach on the other side to see these. Some extreme minus tides show off vast marine gardens on the rocky ledges around here. Even more are found at the extreme northern end of this secret beach, where tons of starfish live on the sea stacks. More about Oceanside, maps and beaches with tide pools. Head to the extreme southern end of the beach, where a few marine gardens show up. It’s only possible to see these during calm conditions. In fact, you shouldn’t touch this beach if the tide is even a little unruly. No tide pools until about 15 miles south, at Pacific City. More about Cape Lookout State Park and the Three Cape Loop, maps, beaches with tide pools. There is a small but spectacular tide pool selection at the foot of Cape Kiwanda, but they’re only accessible at extremely calm conditions and fairly low tides. 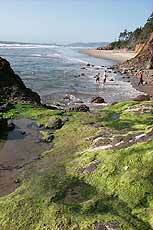 You will find no tide pools until the middle of Lincoln City, at least 20 miles away. Probably the only place you’ll find any tide pools along this otherwise long, sandy stretch will be the ramp at the NW 15th St. There are some rocky spots there. Also, sometimes the rocky bundles beneath Inn at Spanish Head will yield some colonies. More about Lincoln City, maps, beaches with tide pools. 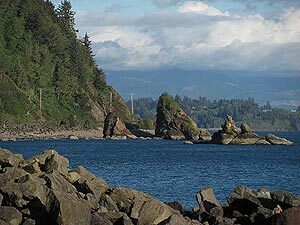 This state park is one oddball beach, especially on the northern cove end. Some bizarre caves and striking, ancient skeletons embedded in the rocks abound here. 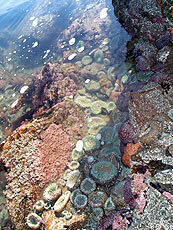 Some tide pools can be found at certain conditions. A tad north of the manic structure, there’s a small beach that features a variety marine of gardens. At the north end of the parking lot is the trailhead that leads down to the beach. 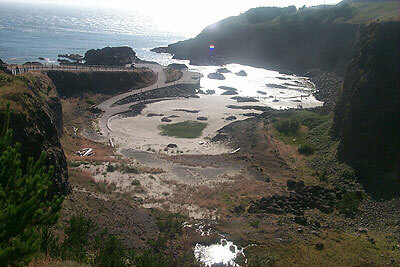 More about the Depoe Bay area, maps and these beaches with tide pools. Grover warned the areas around Depoe Bay, Boiler Bay and Rocky Creek are very poor for marine life because of the pounding that it gets from the wave action. “It is also the most dangerous place to be,” he said. “All areas are posted not to enter, but we constantly have to ask people to leave because of the danger." Grover added there have been a fair amount of deaths in that area. Grover said this area has outstanding tide pools, along with rangers on hand to take folks on tour. The tide pools here are a manmade experiment. In the 90’s, state officials turned this abandoned rock quarry into a maze of concrete walkways and rocky areas, allowing the tide to bring in sea creatures to infiltrate it and colonize it with tide pool creatures. It worked - more or less. This area is often closed off to such exploration in winter, however. The northern face of Yaquina Head, accessible by a mile or so walk from Moolack Beach, can yield some awesome finds. 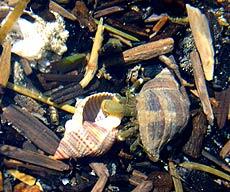 Moolack Beach, however, has the occasional tide pool surprise, especially during winter's lower sand levels. More about Newport, maps and beaches with tide pools. The county beach access just north of Seal Rock (recently made famous by the beached whale that had to be moved to be buried) may also occasionally yield some decent tide pools. 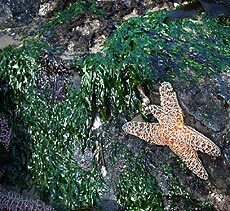 More about Seal Rock, maps and beaches with tide pools. 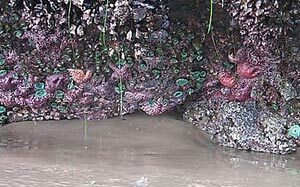 Some rocky areas at the tide line yield these colorful pools. 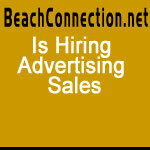 Sand conditions may be too high during some years, however. Complete Guide to Waldport, Seal Rock, Ona Beach area. Next to Devil's Churn: a close-up of sea life. The question here should really be “Where in Yachats can you NOT find tide pools?” The town is all rocky ledges, where the ocean often pounds violently. So stay away from the waves. But even twenty, maybe thirty feet from the tide will show off plenty of places to ogle these wonders. There are about two or three miles of rocky ledges to explore in town, and you can’t wander these basalt slabs for very long without finding something to peek into. This marks a 20-mile-long area where tide pools become insanely abundant, greatly outnumbering visitors to these often-empty beaches. Between here and just north of Florence is a veritable inundation of tide pools. 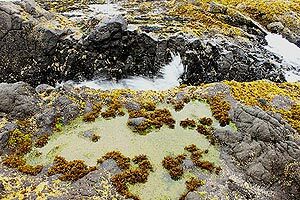 More about Yachats, beaches with tide pools and maps. Wander down the long steps to the rocky ledges (unless the tide is knocking about the rocks) and you’ll find hordes of them everywhere. Walk around the point and find a beach where even more of these lurk in between the rocky slabs that form a labyrinth of basalt structures in the sand. 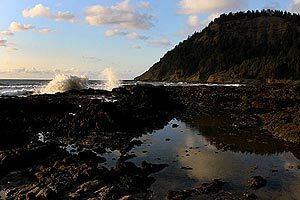 If you hop onto the sand here, you can see the rocky ledge that forms the bottom of Cape Perpetua up close. There, it’s like a metropolitan city of interesting sea life clinging to the rocks. The following beach accesses provide more pools, but there are even more in between these official access points. Sometimes, some of these stretches of beach are only accessible by walking a mile or two, or by staying in one of the hotels on the cliffs above. A huge array of marine gardens occupy the rocks here. Part of this area is handicap accessible from a smooth bridge over the chasm. At the county line between Lincoln and Lane counties, you’ll find this hidden wonder. And what an access it is. A parking lot gives way to two routes to this varied and rather amazing beach. One part is sandy, with a few basalt structures strewn about. 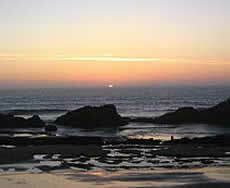 The other is a mass of rocky ledges which also provide tide pooling pleasures. There’s a huge array of colorful colonies dotting this rather lengthy beach. It’ll take you a while to find all of them – maybe more than a day. Anywhere along this kooky, rocky beach is apt to make for great tide pool viewing. Head to the extreme southern end to see weird, mushroom-shaped blobs that emerge at lower tides, with tons of critters clinging to them. There’s also an intriguing cave here. 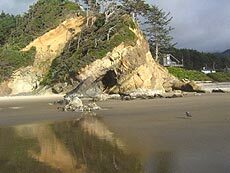 This rather hidden beach and campground has a few tide pools that can be found under the right conditions. There are a few more tide pool hotspots between here and where the sandy beaches begin, but not many. And there are no direct accesses to them.